"Serve warm or cold with pita as a party appetizer, or put on French bread and run under the toaster oven for a great snack or light lunch." 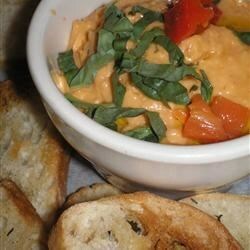 In a blender or food processor, blend the cottage cheese, beans, basil, tomatoes, garlic, salt, and pepper until smooth. Great variation of Hummus! I cooked my own beans(of course drained them) and used freeze dried basil cause I had it on hand. I chilled it and is great on my Pita chips!! This was really good, I am always looking for great sandwich spreads and dips that are healthy and without eggs because we have allergies. Didn't have enough flavor, and was way too soupy/runny. We won't make this again.